British skiers in search of cheap deals and quieter slopes may want to think about heading to European resorts next February half term. 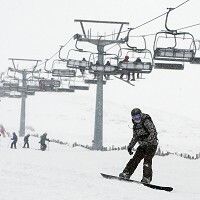 According to tour operators, because next year's spring half term falls during the week of February 11-19 in Britain, one week before the majority of schools in Europe - including those in France and Italy - accommodation is likely to be cheaper and the pistes less crowded, while there could also be deals to be had on the likes of sports travel insurance. Usually February half term is one of the most expensive weeks in the calender for skiing holidays, but Cathy Rankin, a spokesperson for Pierre & Vacances, which specialises in self-catering accommodation in France, said: "The British market will pretty much have the whole of our accommodation portfolio to themselves during the February half term, as the rest of Europe is still in term time." Apartment prices, she added, were up to 33% cheaper during this week, compared with previous years.